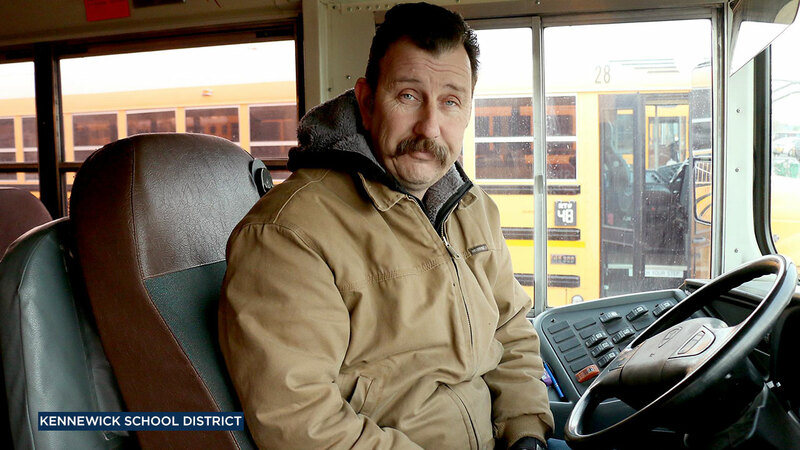 The Kennewick School District said bus driver John Lunceford bought hats and gloves to help students who were waiting in the cold. KENNEWICK, Wash. -- A bus driver in Washington is making sure every student on his route has a hat and pair of gloves for the winter. The Kennewick School District wrote on Facebook that John Lunceford, an Army veteran, noticed one of his students was crying when he boarded the bus on Thursday. Lunceford saw that the child's hands and ears were red from having to wait for the bus in frigid temperatures that morning. "I put my gloves on him and told him, 'It'll be OK, it'll be OK,'" said Lunceford, who has been driving buses for the district for three years now. After dropping his students off at school, Lunceford made a decision that would warm hands - and hearts. Lunceford headed straight to the store to buy 10 sets of gloves and stocking hats. He returned to the school, and with the help of administrators, Lunceford was able to track down the young boy from earlier in the morning who was now in the library. Lunceford handed him a hat and pair of gloves. "I'm a grandfather, you know," Lunceford said. "No one wants a kid to suffer like that." This won't be the last student Lunceford will help out, as he said he'd take care of any student on his route who didn't have hats or gloves.